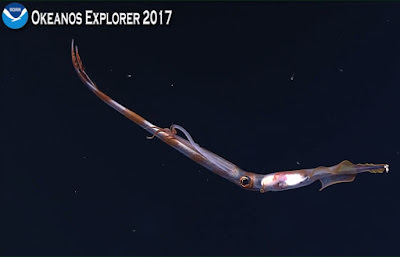 Chiroteuthis is a genus containing 8 species of deep sea squid. They're related to Grimalditeuthis, to which they look similar and live similarly. And that means they have great big eyes, a long slim body and, most importantly, a pair of super-mega-long tentacles that dangle magnificently as they swim. The actual squid may be a mere 15 or 30 cm (6-12 in) long, not including tentacles. Add those tentacles and you easily double that length and more! The clubs at the end of the tentacles even bear photophores so that they can light up and lure prey into snatching distance. As you can imagine, Chrioteuthis squid are quite proud of their fabulous tentacles and would hate to loose them. It's important to keep them safe, especially since they're so long and noodly. That's why they can be retracted to a more manageable length. Not only that, but the squid can then wrap its super-mega-tentacles in a pair of special, membranous arms that act as sheathes. While adults have super-long tentacles, juveniles have a super-long tail! 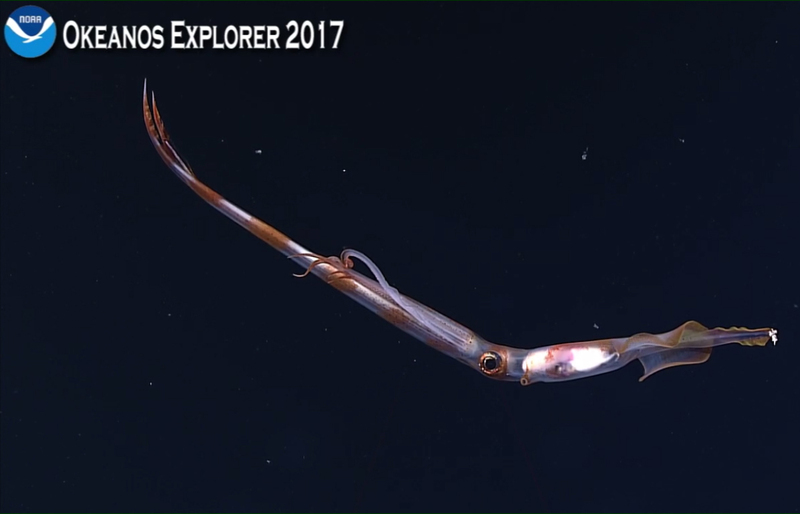 The tail seems to be quite rigid and it can be longer than the rest of the squid. It's also covered in photophores. By lighting them up and holding their body rigid in the water, they can disguise themselves as siphonophores. This is clever stuff! A lot of predators turn their noses at siphonophores because they're like 99% water and stings. Chiroteuthis is not just a pretty pair of tentacles. This one is beautiful. In its cephalopodic way.